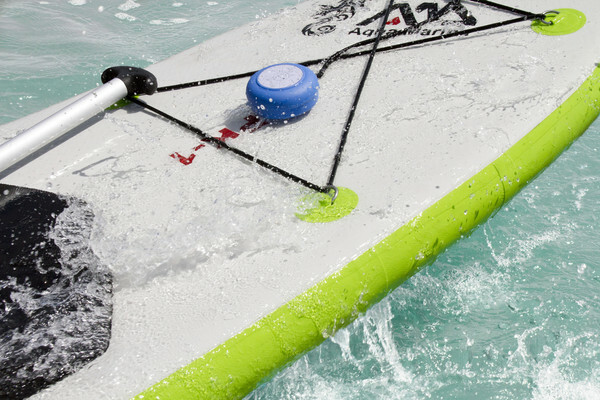 Home Gear Accessories Waterproof Speaker That Sticks To Your Standup Paddleboard! I got the chance to check out the Splash Tunes Pro over the last month. It’s a cool little speaker that has a big quality sound and is waterproof! I love music and I love standup paddling so this is a perfect combination. I’ve used bluetooth speaker before for my office and I have found that they are always hard to connect, lack key features, and just don’t sound that great. The splash tunes pro solves all these problems. Right out of the box it was charged up and ready to go. I simply set my iphone to bluetooth discovery mode, held down the on button until it started flashing…then BOOM! It was connected. If that wasn’t enough, it sounds great, can be made to play super loud (although I wouldn’t recommend it if you don’t want your neighbors sending you nastygrams 😉 ), you can skip tracks on the speaker, and also use it as a speaker phone. Did I mention this thing just plain rocks! It also includes a suction cup that rivals an octopus tentacle in that it sticks to literally EVERYTHING! I put it on my bedroom window, my desk, my shower tiles, and most importantly; it perfectly sticks to my standup paddleboard. No need to worry about it getting wet. This is perfect for solo sup missions where you want to get in the rhythm with some tunes or even in a group sup yoga setting where some peaceful music would help calm your mind. BOTTOM LINE: Get this thing! You can buy it now for $59.95 but the price will soon go up to $99.95 so grab 1 for you and couple for the standup paddlers on your list. You can use it on or off the board.